Note: For a more recent tweaked ingredient list and bag design, open up Lawless Jerky – Sweet Sriracha 100% Grass-Fed Beef Jerky (Recipe #2). The next review on Lawless Jerky will be on a 2 ounce/57 gram bag of their Sweet Sriracha flavored 100% grass-fed beef jerky. This jerky was kindly submitted by the founder and CEO, Matt Tolnick. This Lawless Jerky brand name is distributed by Lawless Jerky LLC, and based out of Santa Monica, California. Matt Tolnick, a former attorney, realized that he could bring more smiles to more faces through his jerky than through his lawyering. He bravely left his practice to pursue his passion: creating artisanal, small-batch jerky with powerful and unique flavors. 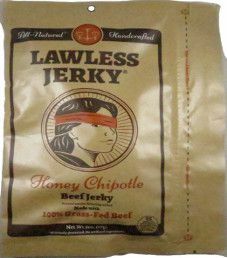 The Lawless Jerky brand name was launched in 2013. Their trademark slogan is “A Braver Flavor”, and another slogan is “So good, it should be illegal!”. 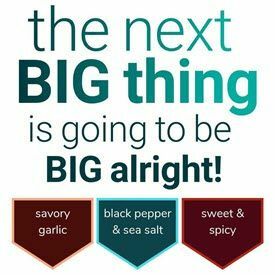 Ingredients: 100% Grass Fed Beef, Rice Vinegar, Sriracha Sauce (Chili, Sugar, Salt, Garlic, Distilled Vinegar, Potassium Sorbate, Sodium Bisulfite, and Xanthan Gum), Brown Sugar, Salt, Ginger, Garlic, Cayenne Pepper. This 100% grass-fed beef is sourced from a reputable farm in Australia. For a detailed explanation on the virtues of using 100% grass-fed beef compared to grain-fed beef, you can read the Just How Natural is Your “All-Natural” Beef Jerky?” article written by Matt. The liquid marinade consists of just sriracha sauce and healthy rice vinegar. Mildly concerning is that this sriracha sauce uses unhealthy potassium sorbate and sodium bisulfite as preservatives. However, these preservatives were never intended to withstand the jerky drying process. Super healthy ginger and garlic are used, which offers multiple health benefits. Cayenne pepper and chilies have healthy properties if eaten in moderation. The sugar level is fairly high at 7 grams of sugar per 28 grams of jerky. For a sweet based flavor as we have here, 5 grams of sugar or less is preferred. The salt level is sort of high at 370mg of salt per 28 grams of jerky. As advertised, there is no sodium nitrite used, or any other similar unhealthy preservative. Instead, salt and rice vinegar to a lesser degree are the main preservatives. 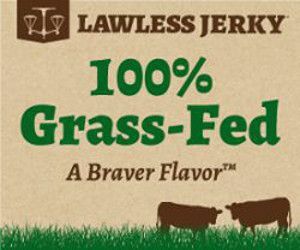 With more kudos to Lawless Jerky, their jerky has no MSG added. 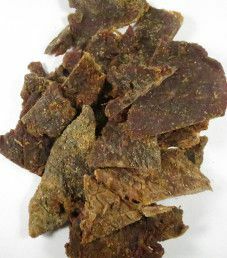 These strips of jerky are mainly small in size, and sliced to a medium thickness. This jerky has a great dry texture, which surprisingly is quite easy to chew. There are no visible signs of fat, and handling this jerky leaves no oily residue on your fingers. The surface of these strips are visibly and liberally coated with spices. As with the smell of this jerky, the rice vinegar is the most dominant taste. The spiciness here tends to creep up on you slowly. You could say that this jerky has a mild to medium spicy level, depending on your tolerance for heat. Again, the goal is achieved with having a sweet taste. The natural beef flavor is somewhat muted with the sweetness level. The ginger and garlic flavors are light tasting. There is a mild saltiness detected. On the whole, this Sweet Sriracha flavor is very tasty, appealing, and addictive. 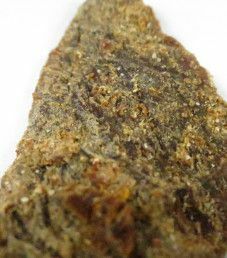 A 2 ounce/57 gram bag sells online for $6.99. That equates to $3.50 an ounce, which rates as an expensive price. If you order all six flavors online, the price is $34.99, which works out to $2.92 an ounce. There is no doubt that 100% grass-fed beef is the healthiest choice on the market. Given that Lawless Jerky hits the mark with a sweet & spicy based flavor, we recommend this jerky as worth your money. Unusually, this bag opens vertically, as opposed to horizontally. Everything is imprinted directly on this resealable bag, both the front and back. There is a graphic displayed on the front of Lady Justice, peaking through a band around her head, suggesting that justice is not always blind. The Lawless Jerky logo is interesting. It is an upside down balance scale, symbolic of Matt turning his law profession on its head when he became a jerky maker instead. There are some facts displayed on this bag such as “Braver Flavor”, “Handcrafted”, “Made with 100% Grass-Fed Beef”, “Authentic Flavors”, “No Corn Syrup”, “No Nitrites”, and “No Nitrates”. All bag categories are covered with this bag except for one. Missing is a transparent window to view the actual jerky. There is a good blurb on the back written about the Sweet Sriracha flavor itself, and about Lawless Jerky. 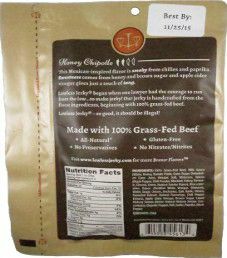 The honey chipotle “beef jerky ” had a nice flavor and I love the fact that it was made with grass fed beef, unfortunately shoe lever leather is more tender, I could hardly chew it. Worst jerky I have ever eaten! I had to throw the other half of the bag away, it wasn’t even worth trying to eat. Sean from Lawless here. We hate to hear about anyone having a bad experience with the product we spend so much time and effort creating and sharing with the world. That being said, there is some variability over time inherent with an All Natural product that we have, and continue to, address so no one has the kind of experience you did. If you’d send us an email at info@lawlessjerky.com we would be happy to provide replacement jerky so you can appreciate both the flavor and texture that we are proud to share. I had the Sweet BBQ Flavor, it was great!!!! It was by far the best commercially made beef snacks that I have ever bought! I found it at my local “big name grocery store”. I have looked for it at other branches, but can’t find it. Please tell me where I can get more. I would like to check on buying a bulk amount.